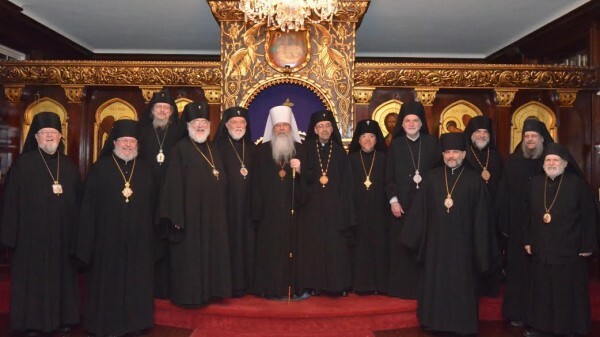 The Holy Synod of Bishops of the Orthodox Church in America concluded its fall session at Saint Andrew House, Detroit, MI, on Friday, October 23, 2015. His Beatitude, Metropolitan Tikhon, presided at the sessions. Among the decisions and actions taken by the hierarchs were the following. In his report to the Holy Synod, Metropolitan Tikhon shared his ongoing work on his “The Apostolic Work of the Church: Building the House of the Lord in Our Lands,” which will provide a “guiding framework for the Orthodox Church in America” during the next triennium and beyond. Using the image of the four pillars of the altar table at the consecration of a church, he proposed that the OCA build its apostolic work on the “the foundation, which is Christ,” and the pillars of the spiritual life, stewardship, evangelism and outreach and external relations. The Holy Synod reviewed the text of a “Service of Prayer after a Miscarriage or Stillbirth,” which was approved for use. The text will soon be available on the OCA web site in PDF format for downloading. A resource dealing with end-of-life issues from the Orthodox Christian perspective, titled “A Gift for My Loved Ones,” was reviewed and approved. Prepared by the Department of Christian Service and Humanitarian Aid, the resource will soon be available on the OCA web site in PDF format for downloading. Members of the Holy Synod expressed their gratitude to His Eminence, Archbishop Nikon of Boston and New England and the Albanian Archdiocese for his decade of devoted service as Episcopal Liaison for the OCA Pension Board. The hierarchs decided that the section on Spiritual Courts that appears in the previous Statute of the Orthodox Church in Americawill remain in effect until the revision of this section in the newStatute is approved. Protopresbyter Leonid Kishkovsky updated the Holy Synod on External Affairs via conference call. A number of decisions presented by the Board of Theological Education with regard to ordination and related matters were ratified. Additional agenda items included a discussion on a number of legal matters, various clergy issues, and the setting of dates for Holy Synod and Metropolitan Council meetings in 2016.